This is kind of a quirky take on the sketch at The Pink Elephant , but I've been in a quirky mood lately, and I hope the gals over at Color Throwdown give me a pass today for their color challenge, their colors are on here with just a couple more. 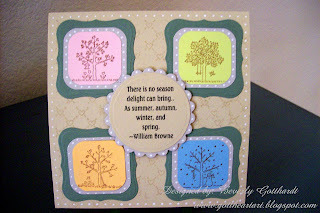 Supplies: Card Blank 6" X 6" cut from 12" X 12" card stock from my scrap box, green card stock-paper pack Big Lots, all other card stock from scrap box, Quote computer generated, Ink: Ranger Archival Ink- Sepia, Stamps: Stampin Up-A Tree For All Seasons, Stampendous-MTC12 Happy Heart Cube, Ranger Inkssentials White pen, EK Success small corner rounder punch, Spellbinders Nestabilities-Standard Circles Lg., Labels One, Classic Scallop Circle Lg., pop dots, Versa Mark Ink. Love your fun card!! Thanks for joining us this week at TPE!! Wow, this is a lovely card--love that Tree for All Seasons...it was one of my first purchases! Thanks for playing the CTD! Great use of that stamp set! Very cute! Wonderful card Beverley. You've covered all wathers with those all season trees. Love it. Thanks for joining the Creative Card Crew Challenge. This is just lovely! Thanks so much for playing the CTD!